Amidst a climate of division, tumult, and fear, what will the United States look like tomorrow? In A People’s Future of the United States, 25 diverse writers synthesize hopeful, cynical, prescient visions of a country shaped by struggle and strife. 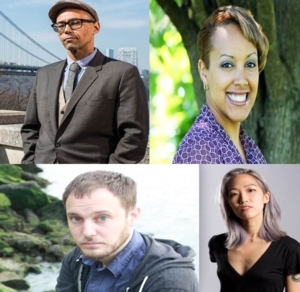 Coeditor Victor LaValle’s work—including four novels, two novellas, and a short story collection—has been named to a slew of best-of-the-year lists by The New York Times, The Nation, and The Washington Post, among others. Featured in this anthology are Justina Ireland, author of The New York Times bestselling Dread Nation; Sam J. Miller, whose The Art of Starving was one of NPR’s Best Books of 2017; and 2016 Whiting Award winner Alice Sola Kim.